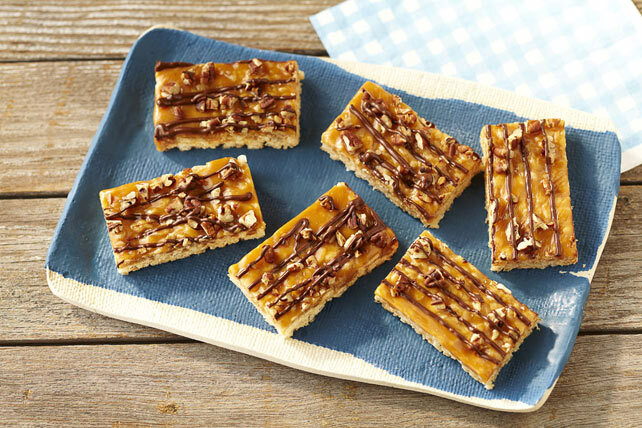 Enhance a bake sale classic with these Chocolate-Caramel RICE KRISPIES® TREATS™. These Chocolate-Caramel RICE KRISPIES® TREATS™ are deliciously gooey. Microwave butter in large microwaveable bowl on HIGH 45 sec. or until melted. Add marshmallows; toss to evenly coat. Microwave 1-1/2 min. or until marshmallows are completely melted and mixture is well blended, stirring after 45 sec. Add cereal; mix well. Press onto bottom of foil-lined 13x9-inch pan sprayed with cooking spray. Microwave caramels and milk in medium microwaveable bowl 2 to 2-1/2 min. or until caramels are completely melted, stirring after each minute; pour over cereal mixture. Spread to completely cover cereal mixture. Sprinkle with nuts; press lightly into caramel with back of spoon to secure. Place chocolates in small microwaveable bowl. Microwave 1 min. or until chocolates are completely melted, stirring every 30 sec. ; drizzle over nuts. Cool before cutting to serve.